HOLIDAY JOY … AND LOTS OF WRAPPING PAPER – In a festive, school-wide event that culminated weeks of planning, each of the more than 400 students in New Brunswick’s Livingston Elementary School received a brand new, tightly wrapped holiday gift. The effort was coordinated by physical education teacher Jennifer Olawski, who financed the initiative by raising more than $10,000 via the Go Fund Me online platform. Photo 1 – Dr. Aubrey Johnson, superintendent, New Brunswick Public Schools, with Livingston Elementary School physical education teacher Jennifer Olawski. Photo 2 – The big day has finally arrived; the students at New Brunswick’s Livingston Elementary School are all ready to receive their holiday gifts. Photo 3 – In perfect assembly-line fashion, the students at New Brunswick’s Livingston Elementary School march across the stage to receive their holiday gifts. Photo 4 – A burst of confetti signals the students at New Brunswick’s Livingston Elementary School to go ahead and open their holiday gifts. Photo 5 – … and, off comes the wrapping paper! Roosevelt Elementary School safety patrol students were honored at city hall by Mayor Cahill! New Brunswick Public School students painted a beautiful zebra-themed mural at Memorial Stadium. Paul Robeson Community School for the Arts' open house event was covered by TAPinto New Brunswick! New Brunswick Public Schools was mentioned in a BroadwayWorld article! Our talented Jazz Band will have the opportunity to perform with Tito Puente Jr. – read more below! The newly-renovated Paul Robeson Community School opened its doors to students on Thursday, September 6, 2018! Read TAPinto New Brunswick's article here! More than 130 grade 5-12 students from New Brunswick Public Schools participated in the 5th Annual Jonathan Casillas Forward Progress Camp, a weekend session conducted in partnership with the school district and hosted by New Brunswick Middle School. Founded by New Brunswick High School graduate and current NFL free-agent Jonathan Casillas (a two-time Super Bowl champion who has played for the Saints, Buccaneers, Patriots, and, most recently, Giants), the event focused on teaching life skills through various classroom activities, and also provided expert, on-field football coaching. The Jonathan Casillas Forward Progress Camp is free to all attendees. Staff members from Cohort 1 of the New Brunswick Aspiring Leaders Program shared their thoughts on leadership qualities! Students at Lord Stirling Community School completed their Read Across America challenge and duct taped school leaders to the wall! Read more about it here! Aliza Martinez, an aspiring 11th-grade journalist a New Brunswick High School, has chronicled the school's global project of sharing cultures with other students worldwide for TAPinto New Brunswick. Read more about it here! The Seal of Biliteracy – symbolic of a student’s achieving the ability to speak, read, and write in two different languages – has been awarded by New Brunswick High School’s World Language department to 49 graduating seniors from the class of 2018. Read more about it here! The City of New Brunswick continued its more than 25-year pledge to help our kids live healthy and safe lives with a new class of nearly 800 D.A.R.E. graduates, all pledging to live free of the negative influences of drugs and alcohol... CLICK HERE for full article! Tahirih Rohoman, a senior at New Brunswick High School, nominated Mathematics Teacher Lynn He for the "My Favorite Teacher" Contest by Barnes & Noble! Fifth grade students from four New Brunswick schools did their part to help keep New Brunswick clean and green during a successful School Kids Sweep Up Day event on April 17. CLICK HERE for full article. Being absent for just two days each month means a student will miss 10 percent of the entire school year – enough to negatively impact that student’s academic performance. It’s sobering information, and a clear demonstration that chronically absent students are at a tremendous educational disadvantage, one from which many of them will never recover. And, it’s why New Brunswick Public Schools has initiated a district-wide program to address head-on the issue of students missing school... CLICK HERE for full tapinto.com article. 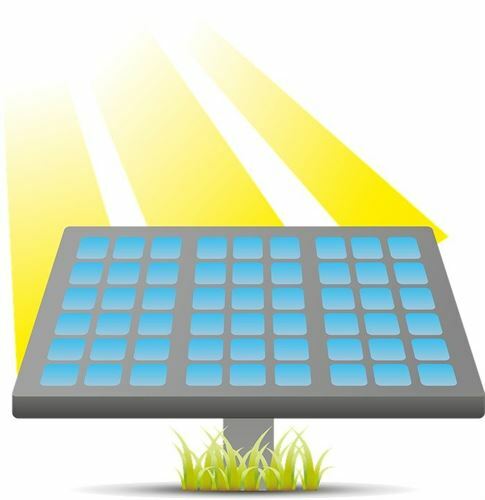 The City of New Brunswick, New Brunswick Public Schools and the New Brunswick Parking Authority teamed up and have used a power purchase agreement to help light up our town since December of 2009, leveraging public structures and spaces to generate energy from the sun... CLICK HERE for the full article. As hundreds of thousands of students from across the U.S. converged on Washington, DC for the recent “March for Our Lives” demonstration, more than 30 New Brunswick High School students were on hand to join the historic protest against gun violence. They were transported to Washington, along with select faculty members and administrators, on a bus provided by the school district. New Brunswick students also took part in the March 14 “Dear Parkland” walk-out demonstration. An article about the events on March 14, 2018 was submitted to TAPinto New Brunswick by Senior Tahirih Rohoman, one of the many talented journalism students at New Brunswick High School. New Brunswick High School and middle grade schools participated in today’s nationwide demonstration against gun violence, which also memorialized those who lost their lives last month at Florida’s Marjory Stoneman Douglas High School. The students took the lead in planning the events and were supported by New Brunswick Public Schools staff, administrators, and community leaders. We support their voices and their commitment to making changes for a more peaceful future. Voices raised in solidarity do not go unnoticed. New Brunswick High School was the host site for EdCampNJ 2017. 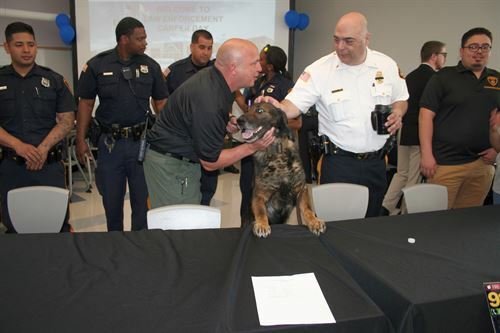 This event allowed its 413 participants – from school districts across New Jersey, and beyond – to create their own session agendas as the event began. The day was highlighted by person-to-person exchanges and hands-on learning, with much of the discussion centered around technology-based educational innovations. The fourth and final New Brunswick Public Schools "Superintendent's Parent Learning Night" of the 2016-2017 school year was held recently at Lord Stirling Community School. Nearly 250 were in attendance. Students, their families, teachers, support staff, administrators, and Superintendent Dr. Aubrey Johnson all joined the fun. The continued collaboration between the district staff -- who volunteer their time -- and Lord Stirling parents made for yet another successful event. New Brunswick Public Schools’ third of four 2016-17 “Superintendent's Parent Learning Night” sessions was held recently at New Brunswick High School. Approximately 150 parents and relatives, plus faculty, staff members, and administrators were on hand for the event – along with 40 student volunteers who helped with set-up and then provided support during the session. The Learning Nights are specifically designed to provide families with insight on how students learn and what they experience on a daily basis. The first of the four sessions was held in December at Roosevelt School, with the second following in February at Woodrow Wilson School. A video slideshow of the high school’s Learning Night can be viewed at this link. Digital images are available at this link. Details on this school year’s concluding Learning Night – including date and locations – will be announced shortly. The New Brunswick High School event was supported by six community partners – Live Well New Brunswick, the Puerto Rican Action Board, the State Theatre New Jersey, George Street Playhouse, the Google Community Leaders Program, and CoLAB Arts stART – and benefited from donations by Airgas Healthcare, Lincoln Park; Christopher Tullo, NBHS teacher; Coca-Cola, Monmouth Junction; Costco of North Brunswick; Destination Dogs, New Brunswick; Esquina Latina Restaurant, New Brunswick; The Green Turtle, North Brunswick; Home Depot, South Brunswick; Jonathan Casillas, New York Giants; Karen Selby, NBHS teacher; Shop Rite, Spotswood; State Theatre New Jersey, New Brunswick; US Foods, Perth Amboy; UTZ Quality Foods, Freehold; Whitney Museum, NYC. One more New Brunswick High School student will attend an elite university this fall. Current senior Linnette Morel was recently accepted to prestigious New York University, in the heart of Manhattan. Earlier this year, Morel’s classmates Dilcia Hernandez and Jocelyne Cruz were accepted by the Ivy League’s Cornell University, while classmate Jadelyn Flores was accepted by Princeton University, also of the Ivy League. On Friday, March 17, 2017 our AVID 9 students, along with six AVID seniors, visited our AVID 9 neighbors to the “North”. The North Brunswick AVID students and staff welcomed our students for an afternoon of team building and discussions led by the New Brunswick AVID seniors. Students from both schools worked together and solved all the various team building challenges given to them. Our seniors spoke about how AVID has helped them to be successful and their future plans. It was a wonderful afternoon and we look forward to visiting with our “neighbors” again. Please enjoy the pictures below. For the third year in a row, a NBPS student has been selected to participate in the New Jersey State Youth Art Month Exhibition, which features works by six Middlesex County students. New Brunswick Middle School 7th grader Gretel Bernal will have her art displayed at the formal exhibition on March 9, in Trenton’s capitol building. Eligible students submitted one piece of art; works to be included in the exhibition were determined by a panel of art educators from throughout the county. NBPS Visual Arts instructor Danielle Fleming coordinated submissions to the annual exhibition by district students. The New Brunswick, NJ public school district consists of two high schools, a middle school and nine elementary schools, offering a comprehensive educational program for students in grades pre-kindergarten through twelfth grade and serving more than 10,000 students. Students from Japan’s Fukui City, which enjoys a long-standing “Sister Cities” relationship with New Brunswick, recently visited New Brunswick Middle School. There, the Japanese youngsters toured the building, attended dance and art design classes, and chatted during lunch with their local peers. Gifts were also exchanged. As a component of the ongoing “Sister Cities” relationship, Fukui City annually hosts a group of select New Brunswick students. Note: Images of the visit by Fukui City students are available here. Under Sprint’s 1Million Project, 300 eligible New Brunswick High School students recently received a free smart phone, tablet, or hotspot device featuring 3 GB of free, high-speed LTE data per month (unlimited data at 2G speeds after that), hotspot capability, and unlimited domestic calls/texts on the Sprint network. The project provides devices with internet access to high school students across the U.S. who otherwise wouldn’t have online access at home. Pictured are various New Brunswick students receiving their free devices, along with instruction on usage and input on appropriate online communication protocol. New Brunswick High School students will receive devices through the 1Million Project for a five-year-period. There’s a big difference between theory and a real world challenge – a lesson 15 New Brunswick High School engineering students have now learned firsthand. With the district’s Paul Robeson Community School for the Arts in the midst of a multi-year construction and expansion project, high school teacher Patricia Chilelli perceived a unique instructional opportunity. She decided her Introduction to Engineering class would learn about municipal construction, as they undertook a long-term project focused on developing designs for a complete science lab… which would fit within the very specific constraints of the Robeson School architectural blueprints. 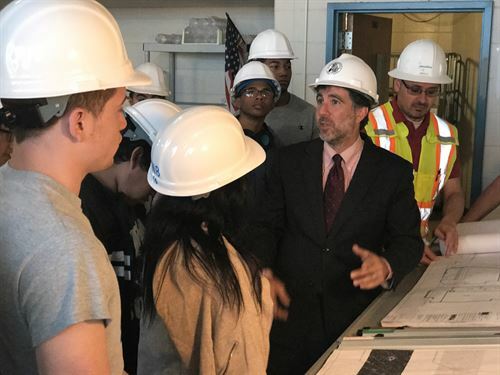 And fortunately for the 15 students – who were divided up among four distinct teams – they were even able to visit the site of their lab, thanks to a pair of in-district field trips coordinated by the NJSDA and New Brunswick Public School’s director of Facilities, Design, and Construction, Frank LoDolce. The class’ four final plans and 3D models – one submission each from the teams Victory, Academy, JAGD, and IEJR – were presented during a June meeting of Superintendent of Schools Dr. Aubrey Johnson’s cabinet. All successfully addressed the challenging parameters Chilelli had established. “Often, when you give students a complex, long-term assignment like this one, you don’t know what the final outcome will be,” Chilelli explained. “The most valuable, educational experience is the overall process – the success or failure of the engineering itself is decidedly secondary. But in this case, I’m proud to say the students did a fabulous job and each of their four science lab designs were terrific. superintendent for Curriculum and Instruction for New Brunswick Public Schools. NEW BRUNSWICK, NJ (June 21, 2017) – As part of the New Brunswick Sister Cities Association educational and cultural exchange program, four Woodrow Wilson School students, two New Brunswick staff members, and a New Brunswick firefighter and his son recently traveled to the central European nation of Hungary. There, the group spent the first day of its visit in the historic capital city, Budapest, and the remaining eight days of its stay in the renowned cultural center of Debrecen – with which New Brunswick has enjoyed a 25-year sister city relationship. The four students who represented Woodrow Wilson School during this year’s cultural exchange trip were Ashley Caldwell, Erin Eckert, Sheila Nunez-Duran, and Levania Velsaco-Uscamaita. Accompanying the students as chaperones were Woodrow Wilson School teacher Annamaria Papp and Woodrow Wilson School Media Specialist Michael Leone. Also joining the trip was New Brunswick firefighter Fred Obado and his son, Madden Obado. The Obado family has a long history of active involvement with the New Brunswick Sister Cities Association. Encouraging involvement in educational, political, cultural, and economic activities, the New Brunswick Sister Cities Association works to build mutually-beneficial, cross-cultural relationships with its sister city. New Brunswick Public Schools recently celebrated the 20th annual Read Across America Day, which is held each year on Dr. Seuss’ birthday. To mark the occasion, Dr. Aubrey Johnson, superintendent – along with district administrators, teachers, staff, and members of the community – visited classrooms throughout the district and read books to students. In addition, some classes participated in other activities celebrating the 113th anniversary of Dr. Seuss’ birth. NEW BRUNSWICK, NJ — For weeks, rumors have floated around the city that some undocumented immigrants are afraid to go to work or school. Aubrey Johnson, superintendent of New Brunswick Public Schools, said last night that he and his employees have the backs of all students, including undocumented immigrants. The district has various polices in place that protect students’ rights and privacy, he said. business with his dad in Hunts Point in the Bronx. You might've seen a late-night HBO special on the area. And he worked more than 15 years in Paterson's schools.